For my final project, I threw together a little synth with an interface to change between types of waves, as well as add a lowpass filter, high pass filter, or bandpass filter. The basic functionality of the synth is you can use your top row of keys to play a chromatic scale starting with Q, moving stepwise through the row (Q -> P) and then the last three half steps are in the next row down (ASD). You can adjust where the chromatic scale lies on the keyboard by pressing the arrow keys. The left and right arrow keys will shift the octave a half step up or down, and then the up and down arrow keys will shift the entire scale an octave up or down. You can do this while playing a note to have some cool effects. Another note, the keyboard is made to be able to play multiple notes at the same time, so play around with harmonies and stuff! The only issues come up when the notes frequencies become too close, and start phasing with each other… Also, if you are playing a perfect 6th and try to play a third note, the third note will not play. I’m not entirely sure how to fix these bugs. Currently, the envelope for the filters are pre-set. Moving forward I’d like to implement some sliding-bar controls to control the envelopes. Also, the documentation on the p5.sound bandpass filter is very little, so I was not entirely sure how to control the range or location of the bandpass. Other than these things the synth should work great! For maximum effect, use headphones. Put on a song you like on youtube or something, and try and jam out to it. For my final project, I’d like to propose a generative landscape at a more detailed and complex scale than our prior project. Specifically, there are a number of aspects that I’d like to implement into this animation. One, I plan on using L-systems to generate some of the shapes implemented into the terrain. Perhaps most obviously plants, but also on a more abstract level, L-systems could be used to generate interesting backgrounds/horizons. 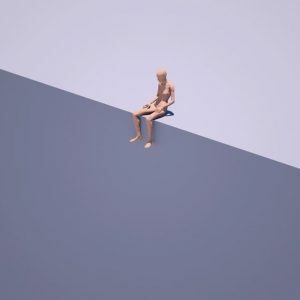 Two, I want this project to be distinct from our prior project in the sense that the program will generate a singular landscape that the “player” can roam around in. I like the idea of creating a space that is constant, since then there can be much more attention to detail by the audience. Also, with a scrolling generated landscape, there is no stillness… and I think stillness is a quality I enjoy in artwork, and look to implement in my own. Three (though this is more of an optional aspect), I am considering making my landscape a sort of collage, or mixed media landscape. I mean this in the sense that I would create physical objects that I then take pictures of to implement into the animation. 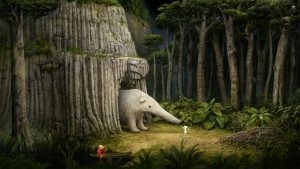 This idea was largely inspired by Samorost 3: an artistic video game, actually largely renown for its soundtrack. 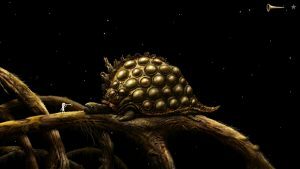 A stylized turtle sitting on the edge of a comet that is actually a root system of some sort of massive tree. My final project will mostly be focusing on animation, so my primary focus for this weeks looking outwards was aesthetic inspiration, as well as interesting ways of generating animations. So, while doing research, my largest aesthetic inspiration came from the game Limbo, created by the video game studio Playdead in 2010. A screenshot of Limbo gameplay. 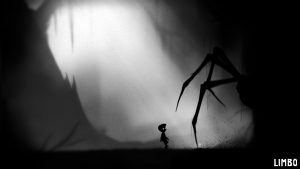 Limbo is characterized by this sort of disturbing, nightmare-scape. I’d like to incorporate this same beautiful, nightmare mood into my own work. I think what I admire most about Limbo is its capability to create something so disturbing, but so breathtakingly beautiful at the same time. After that, I was trying to think of the animation from a coding sense. That’s when I stumbled upon L-systems, actually mentioned in another student’s looking outwards from a few weeks ago. After some initial research, the subject sounded super interesting, and I went looking for artists using L-systems in their animations. 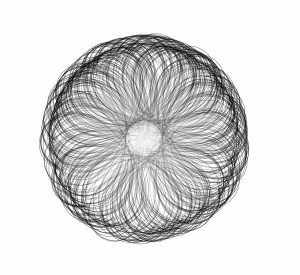 William Chyr came up pretty fast when I googled L-systems, and his work seemed to adequately demonstrate to me the potential of L-systems in regards to visual aesthetic. 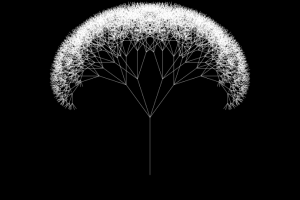 The above image is probably the simplest of Chyr’s pieces, but also really concisely describes the visuals of L-systems. What interested me more than just his still images, though, were the animations that developed over time. I think that seeing the program rapidly increase in complexity to form a full image is much more impactful or interesting. It captures the viewers wonder, as he or she watches a line begin to split and branch out without any idea of what the final shape will be. For this week’s looking outwards, I looked at Ryoji Ikeda. 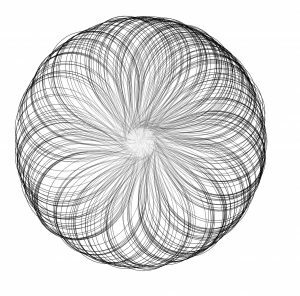 Ikeda is a musician/visual artist that uses mathematical complexity and aesthetic to create his work. Much of his work uses raw audio forms, such as the sine wave, at the edge of the human ability to hear. With this audio, he switches between using them to create tones and percussion, with beat patterns emerging throughout many of his pieces. The visuals are an extremely important aspect to some of his pieces, one of which is called “The Transfinite”. This was a massive installation at the Park Avenue Armory in New York. What I really appreciate about Ikeda’s work is how it bridges multiple disciplines effectively. As I’ve mentioned in many of my prior looking outwards posts, this is what I aspire to do in my own work. Although I wouldn’t say that this project is polished or complete, I think it was a great learning opportunity for me. While playing around with a turtle, or many turtles, creating hundreds of thin lines, I realized that turtle graphics (or at least that style of turtle graphics) allowed me to create an entirely different aesthetic — one reminiscent of hand drawing. After I had gotten all excited about making these pencil sketch images, I began to play around with more abstract drawings. There were a bunch of these that I was playing around with, and honestly I’m not sure which I like best compositionally, but the last one I worked on was this eyeball-esque shape. 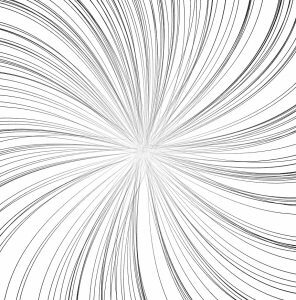 The program takes a bunch of straight lines, and bends them towards the center, creating the illusion of a hard circle filled with a bunch of ellipses. Then, as the line reaches the center, sin() switches from positive to negative, and it bends in the other direction, moving out towards the parameter. The lines then proceed to curl again towards the center, creating a sort of loose rim around the circle. I enjoy the slowing effect as the line curls, since it creates the feeling of tension or elasticity. I hope you enjoy! This project was SO MUCH FUN. I had way too many ideas for just this week, so after I finish this post I’ll probably go back to making portraits. At first I had only abstract concepts to work towards. Like gravity was definitely something I wanted to play around with. Unfortunately, I ran into issues with how ridiculously long it took to load the program every time I ran it…. there was no way I was going to be able to make anything that complicated. I was worried that I might not even finish the project! (every time I loaded the image it took on average 7 minutes to load. That’s like 8 an hour). So, a good portion of my work on this project was figuring out how to make it run faster. After reading around on the reference page, I figured out if I used loadPixels, I could directly access the pixels array, and thus get the pixels information way faster. And.. hurray the code runs almost instantly! I had a couple hours left, so I didn’t have room to be QUITE as ambitious as I wanted to be for this project (I was honestly going to turn in like 5 different codes as variations on a theme). Nonetheless, I think it turned out pretty well. I wanted to get a sort of old video game aesthetic going, so first I coded that up. First step in the process. 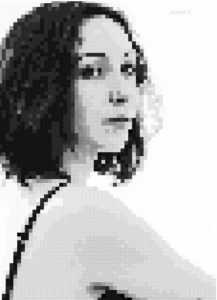 transforming the image into these block-ey pixels and getting the contrast right. I played around with the size of the squares used to create the image, and the contrast between the darker parts (like the hair and lips) and the lighter parts (skin), but ultimately settled on the image above. Next, I (accidentally) made the stroke() color on the square pixels 10 below the fill color. This gave the image a more tile-esque look to it — closer to that old video game vibe I was going for. I decided to play around with that (intentionally this time), and settled on a white stroke. The reason being, is I wanted to print out the image on a huge poster, and have the affect of a bunch of separated squares, instead of a filled canvas. Second step in the process. I was playing around with adding a border around the block pixels, and decided I liked the white border. At this point, I felt like the portrait was pretty good, but I wanted to do something a little bit more. Also, I just wanted to do something with code that is a bit out of my comfort zone… so I implemented objects into the portrait. I made each “tile” start at the bottom of the canvas, and slide upwards at varying speeds until it reached its correct location on the canvas. I particularly like the effect that occurs around the bottom of the hair, as the dark pixels are sliding under the lighter pixels that have already reached their destination. Click the in the image below if you want to see the program run again! 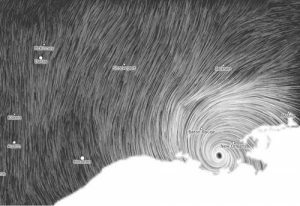 This is a project called Wind Map, by Martin Wattenburg. 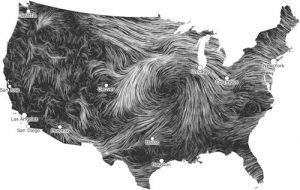 It takes in surface wind data from the National Digital Forecast Database once per hour, and generates these images based off of that information. What I enjoy about this project is how it bridges the gap between informational and emotionally representative. Looking at these images, I can both see what the wind patterns were like in that moment and feel the emotion of that wind. I believe that, when representing information, there is an opportunity to represent much more than just numbers. I almost feel like saying there is a humane obligation to representing more than just numbers… information has real impact in peoples lives, and thus has an emotional quality to it on some scale. Maybe a good example (though maybe a bit extreme) is death counts. Seeing a bar graph of death counts in different wars takes all of the humanity out of that information. I thought this project was super fun… I haven’t had the chance to do any sort of geometry or math in a while, and this was a nice way to sort of flex those old muscles. To start off, I just clicked around on the geometry site provided for us. I was just looking for a curve that both looked feasible to implement (with out smoke coming out of my ears) and aesthetically interesting. Eventually I stumbled across the astroid, and decided, sure, let’s use that. After that, I just started playing around with how I could draw the shape and modify it. I knew right off the bat that I wanted to do something with a trailing point… so that was actually the first part I coded. After that I added the second rotated astroid (to make the whole image an astroid evolute). On their own, these shapes aren’t super exciting. Originally, since the astroid is a hypocycloid, I was going to play around with the number of points in the curve (instead of just four points). Instead, I went a rotation direction instead. Well, I say rotation, but nothing is truly rotating in the image. In the code, the distance between diagonal points is being altered, to create the illusion of rotation. I thought that was pretty cool, especially with the trailing point moving around. To me this animation feels like a card turning around on one point. For this project, I wanted to mimic the circular shape of the traditional clock in something organic. Incidentally, while playing around with some random behavior, I stumbled across the human eye as inspiration. This project feels pretty incomplete, and I would like to implement some changes relating color to time. For instance, perhaps the color of the iris could mimic the color of the sunset or something.